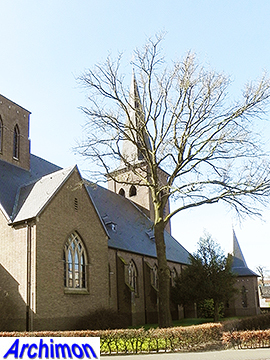 The catholic parish of Heerenveen was founded in 1636 by a Franciscan priest from Germany, and had to make do with hidden churches until in 1841-1842 a true church was built. 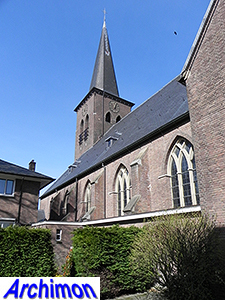 It was a building in neo-Classical style, with a short tower at the front. 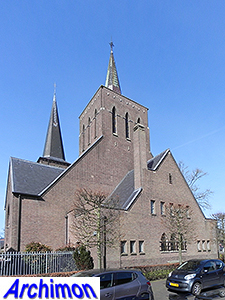 In 1924 the parish intended to replace the church with a new one, designed by local architect J. de Ree. For unknown reasons nothing came of this plan. 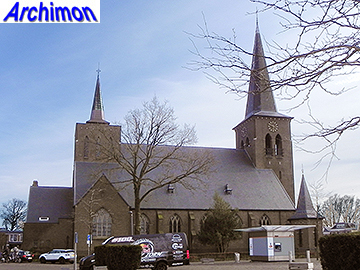 Perhaps shortage of money for what was to be a much bigger church was the reason because in 1928 newspapers announced that the financing of a new church was finally secure thanks to several bequests. 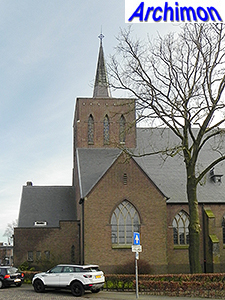 A new plan was made to build a church elsewhere in the village center. 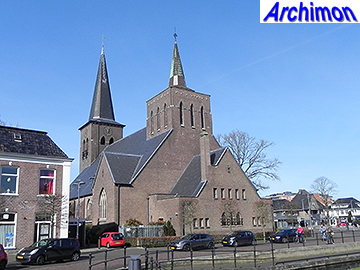 But while the old church stood on the territory of the Schoterland municipality, the new church was to be build in the part of the still divided village that belonged to the Aengwirden municipality. 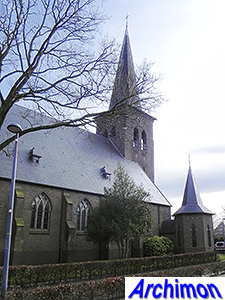 Protests by the reformed church counsil of Schoterland, which had a church close to the border with Aengwirden, that the despised catholic church would stand too close to theirs were of no avail; although the distance between the reformed church and the proposed catholic church would indeed be smaller than regulations prescribed, the buildings would still be standing in different municipalities. 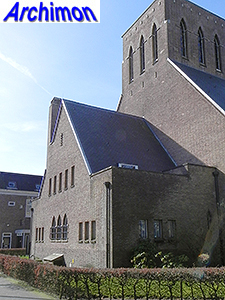 The division of Heerenveen ended only a few years later, in 1934, but by that time the church was completed. 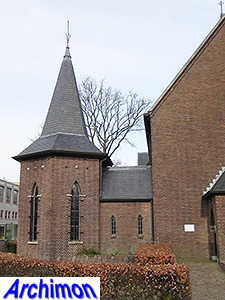 An attempt to sell the old church failed. 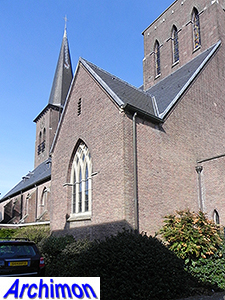 The church was designed by H.C.M. van Beers and is one of his most important works. Although most sources state the design was made in 1932, the tender for the construction was in February of that year, which could not have been done without the detailed plans. Most likely the design was made in 1931 or even earlier. 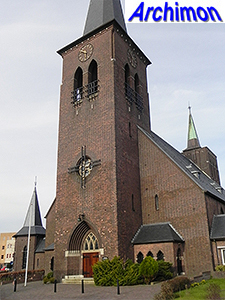 It's a big three-aisled cruciform pseudo-basilica in a style that combines Traditionalism and Expressionism with neo-Gothic influences, mot notably in the shape of the windows . 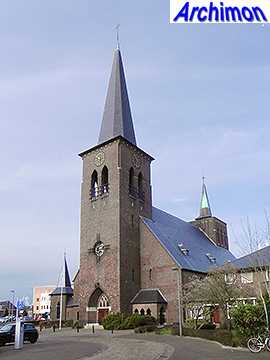 It's a christocentric church with a wide central nave and narrow side-aisles, seperated from each other by a series of pillars and arches which do not block the view at the altar. Complex rib vaults cover this part of the church. 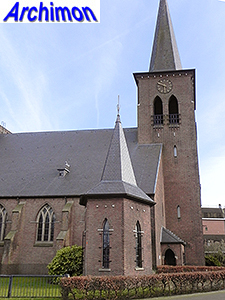 The choir has the shape of a short square tower with an octagonal spire and is illuminated from above by a series of windows positioned in an octagonal lantern that carries the spire. At the back of the church, instead of an apse, is a sacristy. 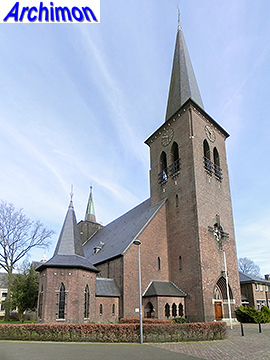 At the front the church has a robust undivided tower, flanked by portals. 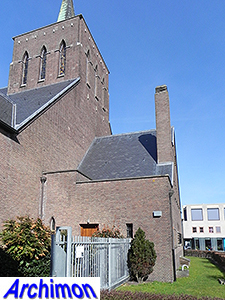 At the north side is a hexagonal baptistry, connected to the church by a short corridor. 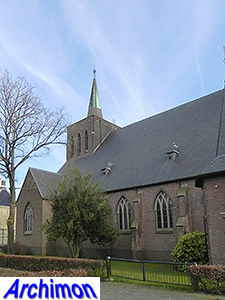 Construction began in July 1932, the church was completed in early 1933 and consecrated in May that year.